Quilting Adventures: Way too long....! I just cannot believe that I haven't blogged in more than a month! Time just seems to fly by! It's not like I have nothing to blog about, its more that I forget about the lapse of time between posts. So.... Yes, I've been a busy bee. I've completed many projects and neglect to blog about it. Sigh! My Coney Island is now a flimsy and I'm hoping to load it on Penelope and have it machine quilted before I show it to you. It really turned out gorgeous. My newest project.... Women of Influence, designed by Sarah Maxwell and Dolores Smith. 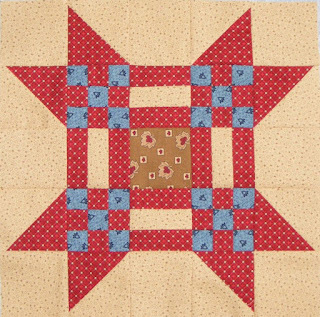 It is a block of the month that the Shoppe will be offering in September. It's a gorgeous quilt! This is the first block and it is in honour of Lucy Stone. There are templates to use, but since I'm not much of a template user, I opted to re-work it. It is such a gorgeous quilt! I've been keeping up on blog land, more as the invisible woman! lol Lot's of talented quilters! Thanks for stopping by! Cheers! It's nice to here from you, Carole! Any plans to start taking online orders for the Shoppe, or do you want to just focus on the bricks and mortar business? I was just thinking about you this week while I was quilting the tshirt quilt and using my beautiful custom made elastic lifts. I'm glad you finally checked in again and it sounds like things are going great for you. Are you going to MQX in April? So good to "hear" from you again. I totally understand your absense, lots of work going on at the shop I am sure, your BOM sounds really nice- I love the block! I'm so happy that you're enjoying the Shoppe...there just is never enough time. I'm sure you have been terribly busy with the shop, but we did miss your blog. I can't imagine having to choose fabrics with the amount of beautiful fabrics that are out there now. How are things going with Penelope? I miss hearing about your playdays with her. We, too, have had a cool summer - until this week. I had summer here :) It would be great to see some of the samples you have done for the shoppe! Your precise cutting and measuring is obvious in your block construction - it looks great. I enjoy following the progress of your shop on the shop blog and enjoying the fun and excitment of starting a new enterprise. I wish you much success. Gosh -- good to have you pop back in -- I was worried the shop swallowed you up. Love that cute little block! Good to see you blogged. Time does get away very easily! Glad the shop is doing well. Love the first block of your new BOM too. Keep at it!